Buying world globes is still a satisfying experience for both the young and old based on how generational globes are. You can go back several hundred years and notice ordinary people and those of renown had globes in either their homes or in their place of work. All you have to do is look at old photos or paintings of prominent people from around the world and you'll frequently see a large globe sitting nearby. The world's population has continuously tried to understand our planet and our place within it by owning globes. Even today, with all of the amazing technology available, Millennials still love owning a globe because they have a full 3D representation of the world available for quick study. Thankfully, many of the best globe makers in the world managed to incorporate new technology into traditional globes to transcend generations. Here at Ultimate Globes, we're proud to offer many of those globes through our online store where you'll find a world globe for work, home and classroom use. What are some of those globe maker names that offer beautiful and stylish globes at prices you'll like? Some of the names are probably familiar to you from either your past, or from other places. Replogle is a name you probably find familiar (although difficult to pronounce) if you bought globes years ago. Founded by a man named Luther Replogle in 1930, the original company had its founder creating his globes by hand, which is the ultimate artistic commitment. Replogle the man is directly responsible for making world globes popular in the home buy developing mass production technologies. In the 21st century, the company name became known as Replogle, and they haven't wavered on being one of the best globe makers in the world. We carry many of their high-quality globes at sale prices for your own use or for your children. 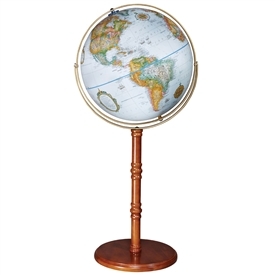 If you're looking for desktop globes, Replogle has some of the best out there. For instance, their 12-inch Hastings globe is a true classic with raised relief on the surface and a beautiful walnut finished hardwood stand. All of the stands from Replogle are high quality so you'll know they'll withstand continuous use. You and your kids will still use these for years to come, just like Replogle's globes from years ago. The same goes for their floor globes that are a throwback to earlier centuries when these type of globes had prominent placement in any home library. 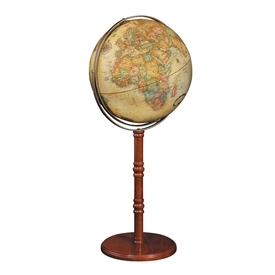 Replogle's Colonial Globe is a good example of excellent craftsmanship with a walnut finish base. You'll find some globes here with the National Geographic name attached, though they're actually made from Replogle as well. Nevertheless, they stand alone in their uniqueness, particularly in their attention to cartographic value within the maps on many of their globes. Some of them are even illuminated, which is a new modern take for use as a nightlight or for education in dark rooms. The Byrd Globe, for instance, is an example of a traditional desktop globe seen 50 years ago combined with updated materials and technology. Check out many of our other globe brands like Waypoint Geographic, IMAX, Kalifano and Zoffoli Globes. Many of these names put out specialty globes that reinvent design and the way you learn about our planet. This includes some globes made of gemstones, all the way to those interactive with sophisticated technology. Whether strictly for school use or for use in the home, we only carry the very best globes makers in the world at reduced prices. 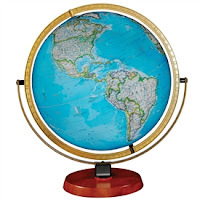 Contact us here at Ultimate Globes to find the perfect world globe you need for any purpose. 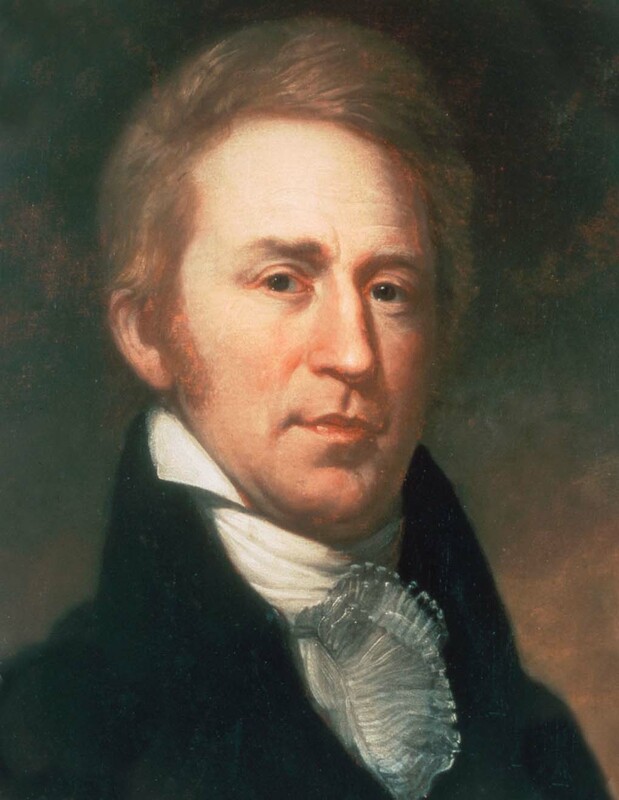 The hall of famous American explorers isn't just lined with the faces of men. Two women in particular, Harriet Chalmers Adams, an adventurer as every bit as daring as Indiana Jones, and Sylvia Earle, the female Captain Nemo of undersea exploration, both transformed the way we view our world and the way culture views women. According to SanJoaquinHistory.org -- a site that covers notable people from the Central Valley in California -- Harriet's adventures began in Stockton, California, a town in the Central Valley, where she was raised. In 1883-84, her Scottish engineer father took the eight-year-old Harriet on a horseback riding trip across California, and the thrilling adventure made a lifelong impression on the girl. After marrying Franklin Adams (another engineer), she and her new husband embarked on a three-year trek through every country in South America. Over the next 40 years, she would explore all Spanish and Portuguese-related countries. She then expanded her explorations to Siberia, Haiti, Turkey, North Africa, and Sumatra. Remarkably, she was one of the first reporters, of any gender, to cover the front during World War I, and she was the only woman allowed access to the trenches. She covered the brutality and development of the conflict with fearlessness. "National Geographic" and "Harper's Magazine" published many feature stories about Harriet's adventures, and she became a national figure. She often embarked on national speaking tours in which she showed slides from her travels and spoke about her remarkable experiences. Harriet was an American treasure: not only did she enrich American cultures with her speaking tours, but she kept America informed about one of the most important conflicts in American history during her time in the trenches of WWI. Although the National Geographic Society did not admit her as a member because she was a woman, she was granted admission to the Royal Geographic Society in Britain in 1913. In 1925, she established the Society of Women Geographers in the United States and encouraged women to pursue their dreams with fearlessness as she did. When she died, the New York Times called her "America's greatest woman explorer." If you've read the classic novel "20,000 Leagues Under the Sea," by Jules Verne, you will remember Nemo, the adventurous underwater sea-captain who commands the Nautilus and spends his life exploring the deepest depths of the ocean. That's essentially what Sylvia Earle did, and still does today: she is one of the greatest explorers under the sea that the world has ever known. The New Yorker and The New York Times call Dr. Sylvia Earle "your deepness." The Library of Congress her a "living legend." She is also an "explorer-in-residence" for the National Geographic Society. Earle has led more than a hundred expeditions and logged more than 7,000 hours underwater, including leading the first team of women aquanauts during the Tektite Project in 1970; participating in ten saturation dives, most recently in July 2012; and setting a record for solo diving in 1,000-meter depth. A saturation dive means the diver is compressed once to work safely at deep depths -- hundreds of feet, maybe even thousands in rare cases -- for days, even weeks at a time, and then they are decompressed once to return to the surface. In other words, if you've ever wondered what it's like to live under the sea, just ask Sylvia Earle. Her goal hasn't just been to have a little fun exploring the deep blue. She's been doing it to make the world a better place for both ocean life and humankind. She has been working on, according to National Geographic, "a global network of areas on the land and in the ocean to safeguard the living systems that provide the underpinnings of global processes." Her solo dive to 1,000-meters (3,280 feet) tied the record for solo diving, set by her then husband Graham Hawkes, and she became the first woman to dive that deep in a solo dive. "As you go down in a vehicle, the ocean goes from light blue, through dark blue, to indigo, to blackness," he says, his hand tracing the arc of descent as he lounges in his boat, clad in jeans and sneakers. "It's a beautiful transition. If you're really lucky, you get into a blackness that is really black and then cut out all the lights and fall through a bioluminescent cloud of plankton." "Sylvia calls it falling through stars," he adds, referring to Dr. Sylvia A. Earle, a prominent marine biologist who is his former wife and continuing partner in business and adventure. "Movies like 'The Abyss' and 'Jaws' make people think the ocean is threatening," Mr. Hawkes continues. "It's not. It's very tranquil. Afterward you get yanked out into blinding sprays, waves and a heaving ship. But down there it's peaceful. You never want to come back. Ever since my first dive, I've gone back every chance I get." Contact us to explore our inspiring collection of globes that might just motivate you to go on your own adventures some day like Adams and Earle. Floor-standing globes basically combine the past, the present, and the future into one beautiful design. In the realm of the past, they recall prior centuries when world leaders (or other people of renown) had giant globes in their homes for interior design and reference. For the present, these globes prove themselves timeless for any room in a home, plus as a handy educational tool for both adults and kids. As a tool for the future, new modern features on many globes offer a look into the state of our planet and where we're heading. We want you to enjoy these benefits of our floor-standing globes here at Ultimate Globes. Take a look at our top five floor-standing world globes to help you make a more educated decision on which one would best suit your office or home. 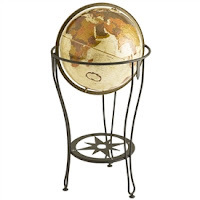 This globe is a real favorite because it looks so traditional with its base and overall way it's designed. Standing at 44 inches, you don't have to hunch over in order to use it, plus it's within equal height of most adults. The globe itself is 16-inches in diameter so you have a large surface that enables you to easily see all locations. With a base made of hardwood accompanying a solid metal base, you can expect quality in how sturdy this globe is. If you have kids around and you're afraid of a floor-standing globe tipping over, you have no worries here because it weighs 25 pounds. 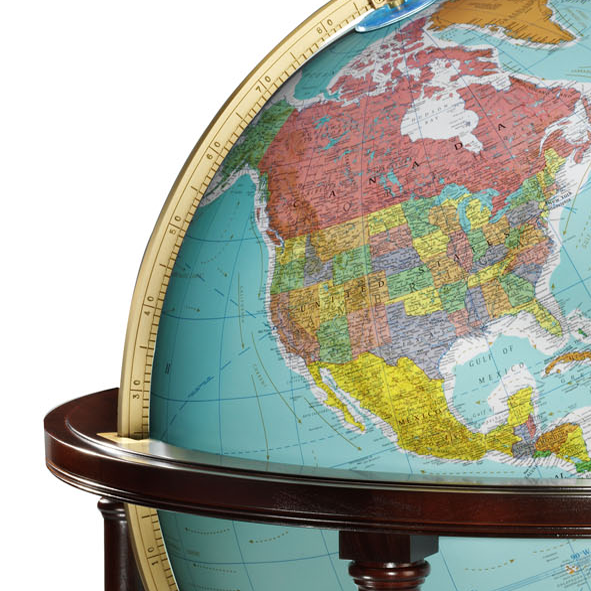 Your kids will also love using this globe because it's updated with all geographic additions from around the world. If you like the "full swing" effect on a globe where you can turn it all directions, you'll appreciate having the feature on this Viking Expedition Globe (plus on the Landen above). While our Viking Expedition globe has a shorter metal stand, it's a beautiful one in a charcoal color. 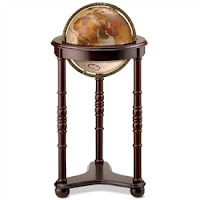 It's a perfect globe to study carefully as you sit in a chair or ottoman in your home or office. Even more so, you have over 4,000 current reference points on this globe, which makes it perfect for exploring if you're searching for international partners in your business. In this regard, you really could be like a viking in charting new horizons. Replogle is one of those companies that deftly creates globes with both traditional and modern features. Their Lancaster Globe is another floor-standing globe that has a perfect blend of old style mixed with modern decor. At 35-inches tall, you have one option on this floor-standing globe you can't always find on others: Illumination. While Replogle also offers one identical that's non-illuminated, the illumination is a major asset in helping you enjoy your globe in a dark room. In addition, it has numerous educational and geographic markings so you can gain a 21st century understanding of the world we live in. 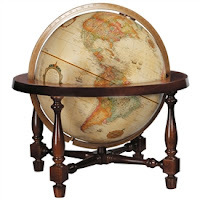 We've had a lot of great comments from our customers about this particular Replogle globe. One aspect they like is the simplicity in the traditional wooden stand as well as the globe having a unique, antique style. At the same time, customers like the raised relief and up-to-date markings. This converts into a desktop globe as well, so it doubles as a conversation piece in your living room while also being an educational tool on your child's desk. As a result, you already save money not buying two globes for two separate rooms. Once again, Replogle comes out on top as one of the best globe makers in the world. This floor-standing globe is another that literally stands tall and suits those who enjoy having a globe with blue oceans for realism. With a walnut-finished pedestal, you have superior craftsmanship for true style in any interior environment. On this model, you also have brightly colored continents that stand out without any illumination necessary. Anyone of any age can learn something from this globe thanks to the meticulous informational detail. Contact us here at Ultimate Globes to find out more about our floor-standing globes and how much they provide in interior design as well as understanding Earth in unique ways. As you spin your world globe, dozens of exotic and exciting locations appear. But what about those large, white expanses on the top of your globe? American explorers were as fascinated by the snowy landscape of the North Pole as with any jungle or desert. But who would reach the North Pole first and what would they find there? A member of the US navy, Robert Edwin Peary was actually assigned to the tropics when he came up with the bold plan to be the first man to reach the North Pole. Peary's original plan was to cross the unforgiving plains of Greenland using a dog-sled, but this 1886 expedition ended when Peary and his companion Christian Maigaard ran out of food. Peary continued to mount expeditions throughout the late 19th and early 20th centuries. 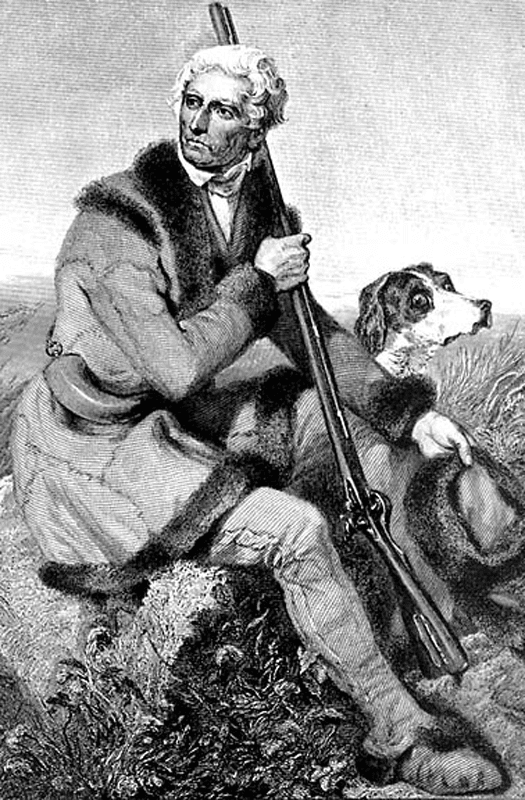 Peary charted many new routes and made contact with groups of indigenous peoples, learning new survival techniques such as building igloos and wearing clothing made of fur. Peary's last expedition ran from 1908-09 and on April 6, Peary made camp (as he claimed) within five miles from the North Pole. Peary was devastated when he returned to the states and learned that another American explorer, Fredrick Cook, claimed he had reached the North Pole on April 21, 1908 (a year before Peary). Cook knew Peary as he had served as the surgeon on his 1891-1892 expedition and saved many of the crew by preventing scurvy using fresh meat rather than vegetables and fruits (which were unavailable). In 1906, Cook attempted to make his name as an explorer by being the first man to summit Mt. McKinley but his disputes with Peary threw doubt upon his claim. Upon his return from the McKinley expedition, Cook mounted his own expedition to the North Pole in 1907 where he claimed to have reached the prize before rival Peary. So Who Got There First? Modern historians have disputed both men's claims believing that while they got very close, they didn't actually reach the North Pole. Critics dispute Peary's navigational documentation and the often inconsistent accounts of his speed. 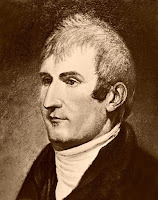 Cook never produced original navigational documentation to prove his claim and the few documents he did release provided patchwork or incorrect data. Debate still rages as to which man, if either, reached the North Pole. The first officially documented, undisputed expedition to the North Pole was led by British explorer Wally Herbert in 1969. Herbert had his own interest in the North Pole having published a book,The Noose of Laurels, which caused a frenzy when it claimed in 1989 that Peary had falsified his records. While many turn of the century explorations were led by men, intrepid women were also looking to the top of the globe for adventures. Louise Arner Boyd, dubbed "the ice woman," inherited a fortune at 33 and used the profits to take repeated trips to the Arctic to photograph the harsh but beautiful landscape and study glaciers, fjords, and seas. In 1928, Boyd lead an expedition to find the missing Norwegian explorer, Roald Amundsen which led her to cross over 10,000 miles of Arctic Ocean - though she was in the end unsuccessful. Boyd led a series of geographic expeditions to Greenland beginning in the 1930s and discovered an underwater mountain ridge off the coast of Norway in 1938. After World War II, the US government chose Boyd for an expedition to study how the unique magnetic fields at the North Pole interfered with radio signals. In 1955, at 68 years old, Boyd made history by becoming the first woman to fly over the North Pole. To find a globe which inspires your next exploration, contact Ultimate Globes.